There are four main navigation tabs: Dashboard, Devices, Events, and Cameras. Each one is accessible from the bottom navigation bar or the system menu in Android. Dashboard - View the widgets you've created to get quick access to your most important devices. 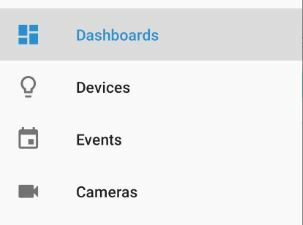 Devices - Browse a full list of all your devices in HS3 along with their controls and ability to filter, search, and create widgets for your dashboard. Events - Run the events you've created in the HS3 web interface from here. Learn how to create events here. Cameras - View web cameras you've connected to your HomeSeer system. Learn how to set these up here. Menu Navigation - Swipe from the left edge of the screen to view these options and select them for quick navigation. This menu is accessible from any screen. IOS does not offer a menu for navigation, you may use the icons at the bottom of the screen.